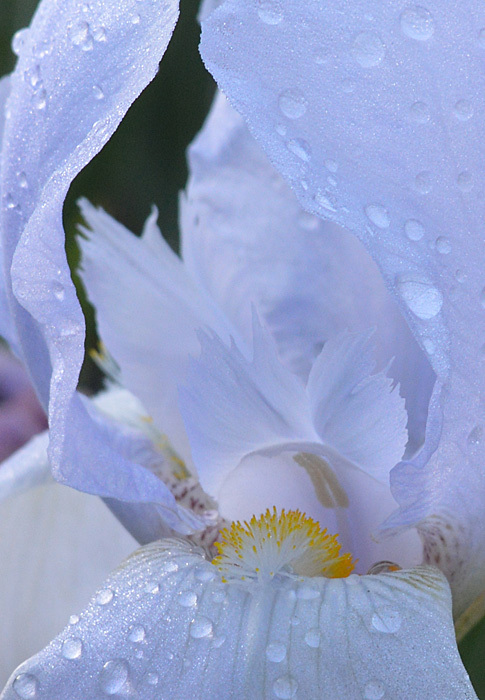 I hope you enjoy the new edition of IRISES, cover below, which you will receive via U.S. Mail very soon. 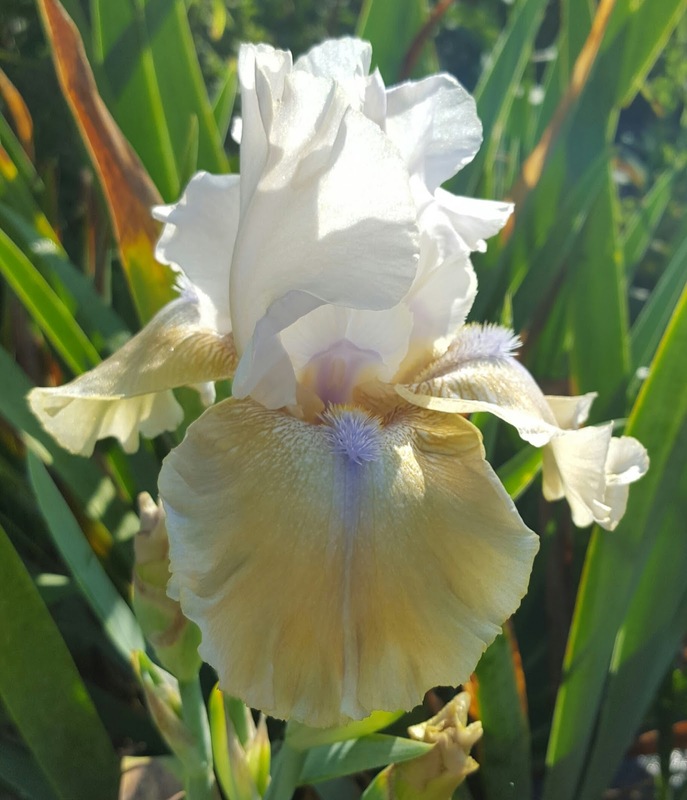 A warm welcome to those who are seeing the gorgeous cover of this issue of IRISES, the Bulletin of The American Iris Society for the first time. 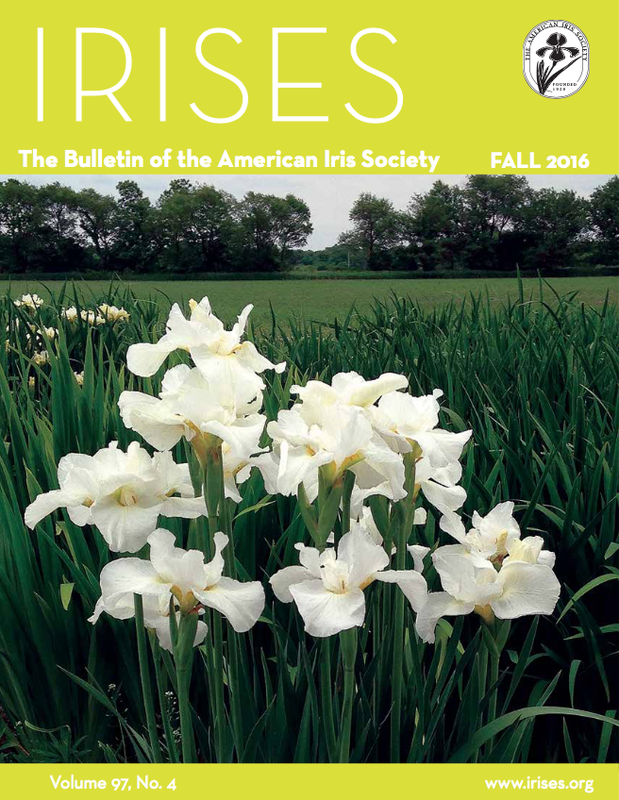 The Fall 2016 issue of the AIS Bulletin will be available soon for online viewing within the Emembers section of the AIS website. Note: to access this area of the website you must have a current AIS Emembership. AIS Emembership is separate from the normal AIS membership. Please see the Electronic Membership Information area of the AIS website for more details. Some article display news: page 2 and 3 have some awesomely large pictures of the 2016 Award Winners. It's a welcome change from New Yorker and guest Editor Jane Milliman, who has become the new Editor of IRISES starting with the first issue of 2017. Don't miss a wonderful recap of all the activities in the various AIS Sections, such as The Novelty Iris Society, The Median Iris Society, the Species Iris Group of North America, The Reblooming Iris Society and others. On pages 12 & 13. What a tender obituary on dear Jean Witt, on pages 14 and 15. If you didn't know her, you will know much more about her after reading this. Don't miss the note about her watercolor work. It's fascinating. 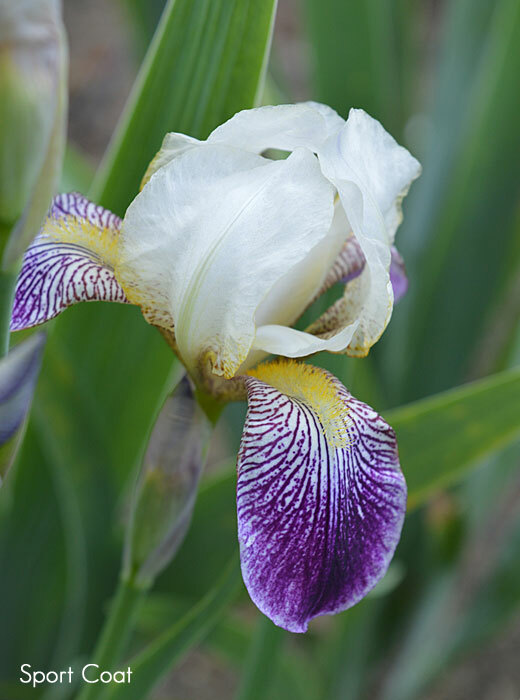 The obituaries continue on page 16 on the passing of Rholin "Keith" Cooley, from you guest it, the famous Cooley's Iris Gardens in Silverton, Oregon. 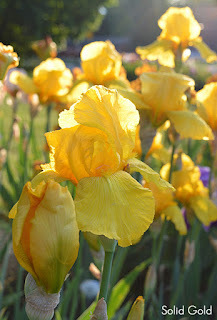 On pages 18, 19 and 20 you will find a wonderful and very descriptive article by Sheryl Campbell, called, "Shenandoah & Potomac Iris Society Beautifies the Valley" You will be visiting two wonderful gardens, the State Arboretum at Boyce, and the Glen Burnie Gardens at the Museum of Shenandoah Valley, Winchester, both in Virginia. Enjoy. 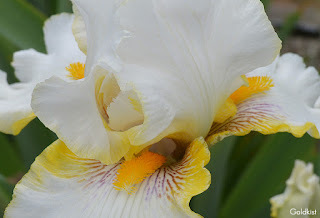 "To get to the irises, you walk through the Pollination Garden observing butterflies, bees, and hummingbirds visiting their favorite flowers." 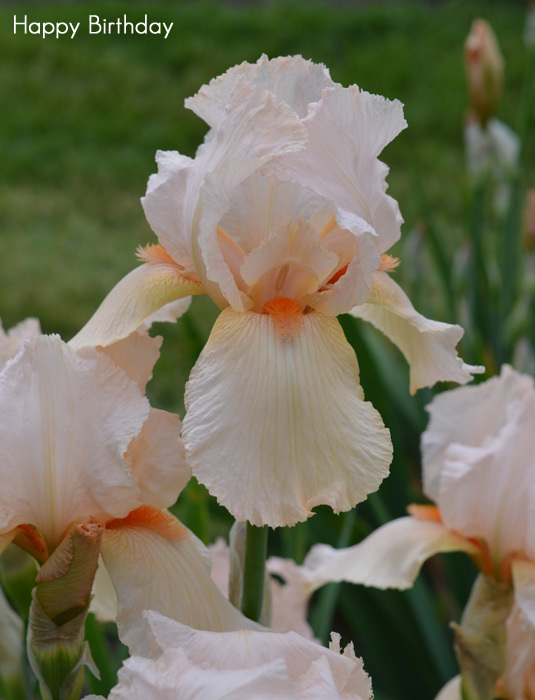 Tom Waters, from New Mexico, knows his Arils/Arilbreds and this impressive article on "Classification of Arils and Arilbreds," will provide you with much information about their nomenclature and perhaps inspire you to grow some in your garden. On pages 21, 22 and 23. 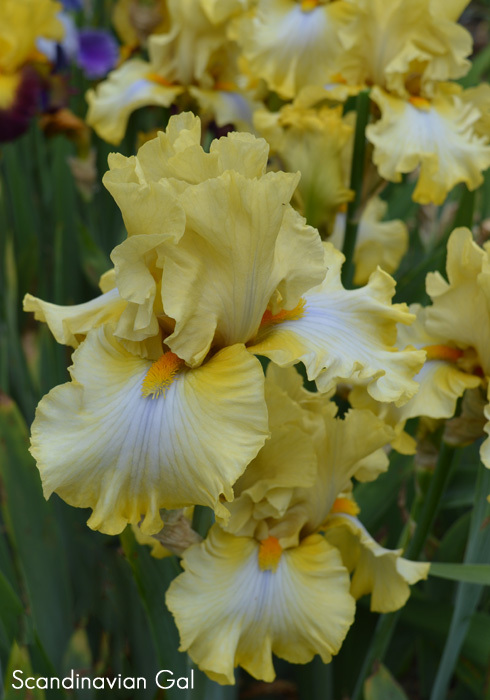 Joe Ghio gives us his take on "Tall Bearded Iris Future," and what will motivate upcoming hybridizers to continue the work as did Joe, Keith and others. Wonderful article, on pages 24 and 25. 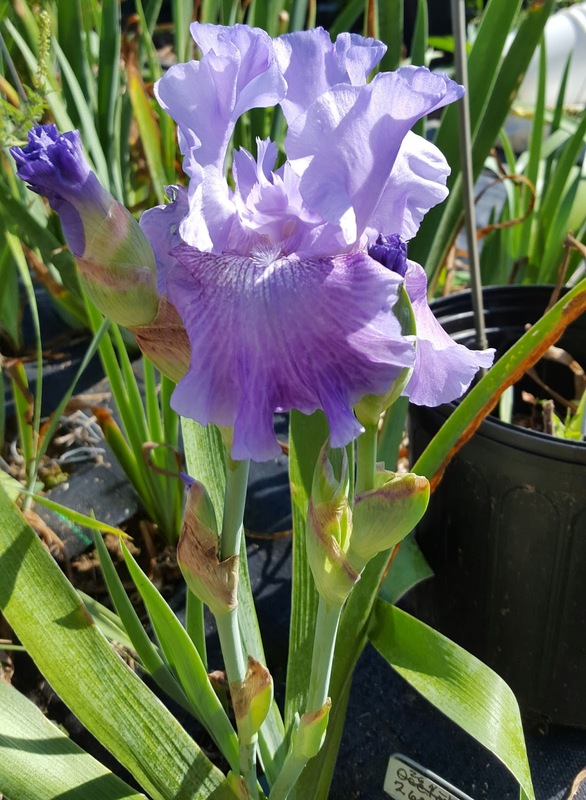 Meanwhile in Virginia, Mike Lockatell writes about reblooming SDBs and how "SDB Seedlings Save [the] 2015 Fall Season." 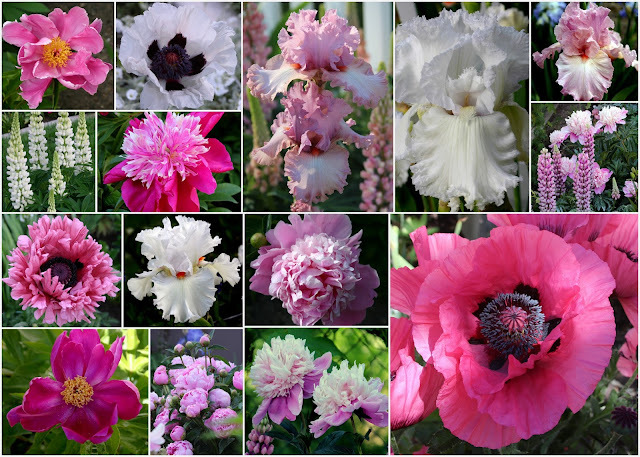 Lovely images of some of his seedlings accompany the article. Don't miss it. On pages 26 through 29. The 2016 Award Winners are listed commencing on page 31. 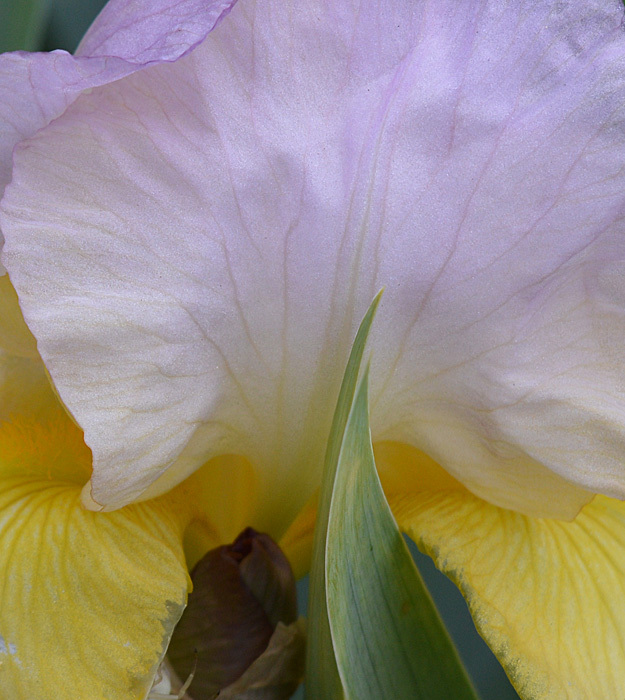 Young and wise, Colin Campbell, describes his introduction to iris hybridizing with amazing close up images. From removing pollen from the pollen parent, to placing the pollen on the stigmatic lip of the pod parent iris. You can read about it on pages 38 through 40. 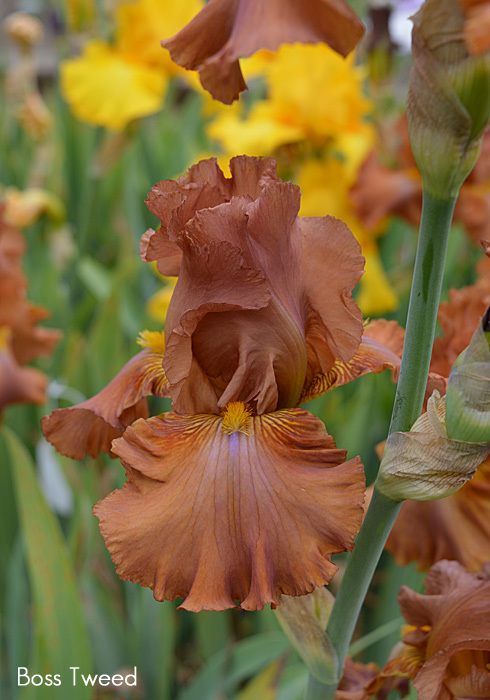 Colin's article is called, "An Introduction to Hybridizing Tall Bearded Irises." 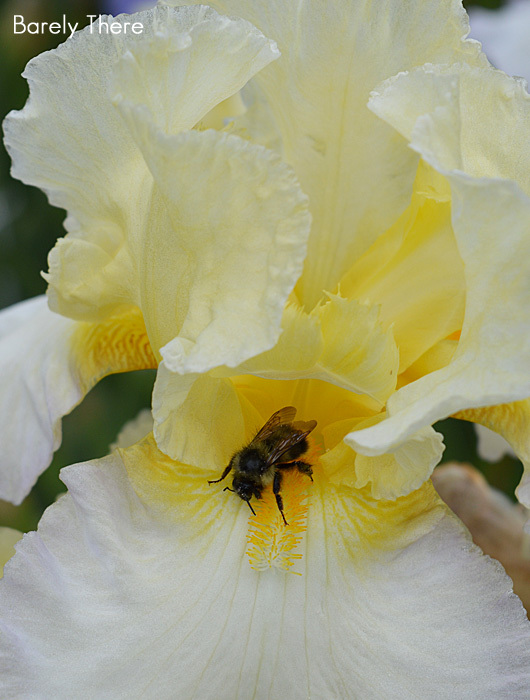 "A little bit more about pollen. Exposure to bright sunlight can be harmful to the pollen grains, so it is important to keep your pollen containers covered when you are out hybridizing in the garden." 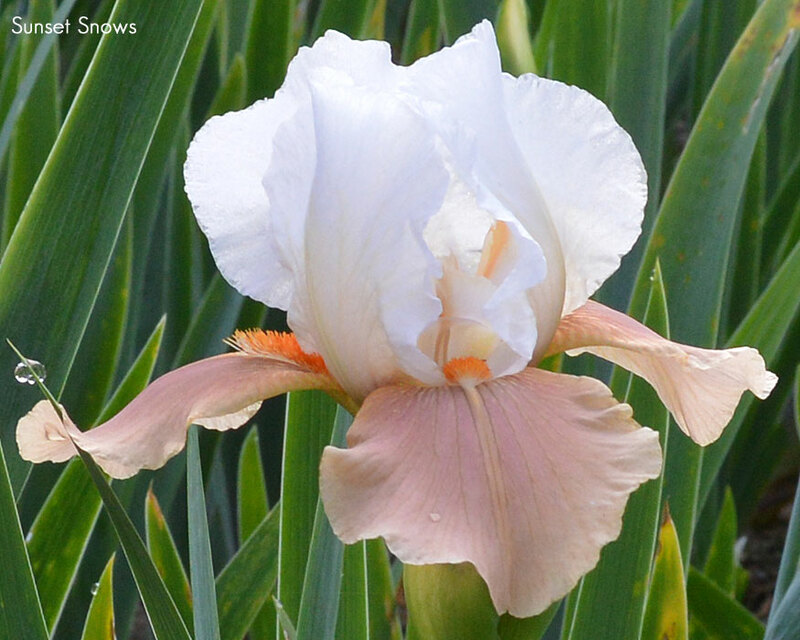 Around September 1, 'Gate of Heaven' opened it's first beautiful bloom. 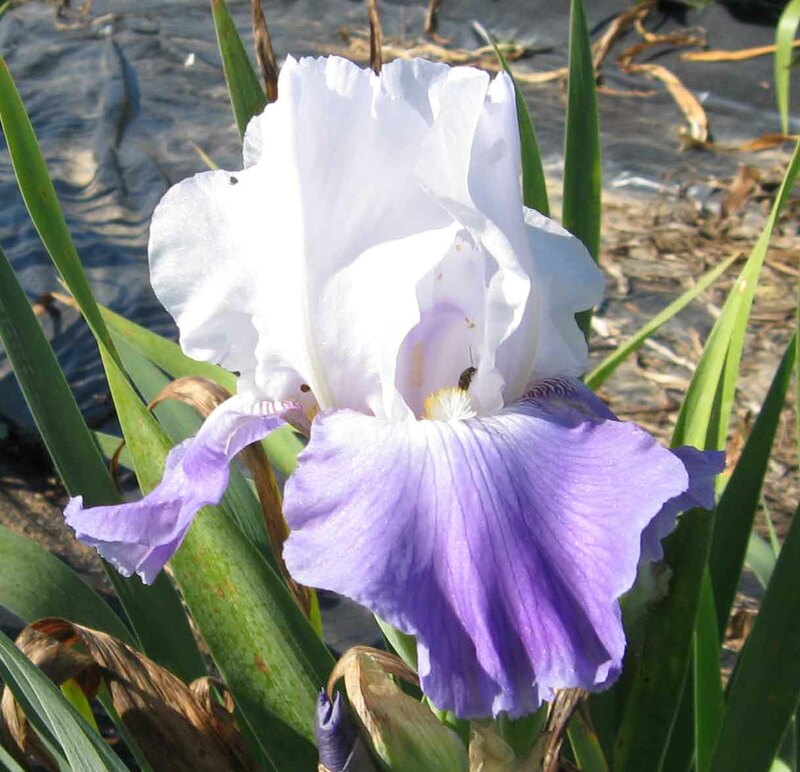 It has great form for an iris that reblooms in Kentucky. I've tried using it in breeding, but so far none of the crosses took. 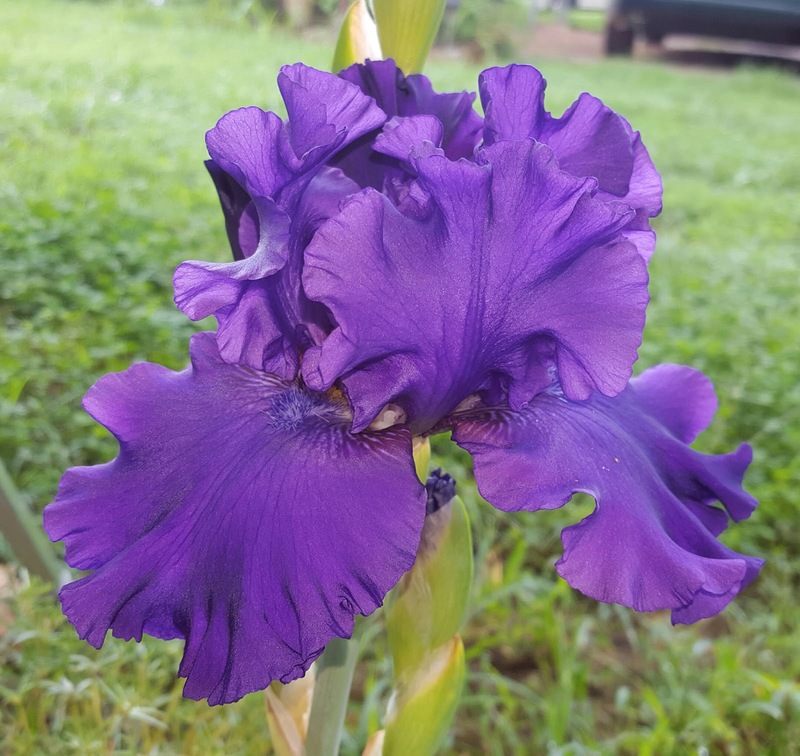 I dug a portion of it and transplanted to another position in the garden in hopes it will produce good pollen or at least take a good pod. There are some California rebloomers that match this form, but none rebloom, on their own, here in Kentucky. 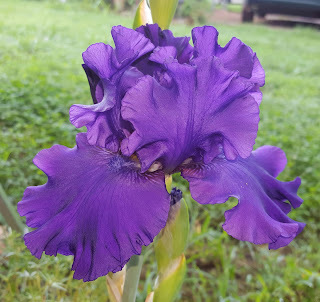 Two of my seedlings have bloomed nearly all summer. This is the first time 1605-02 Re has bloomed during the summer, as it usually only blooms in the fall. ((Victoria Falls x Vanity) x Love Lines) x (Champagne Elegance x Feed Back) is the break down for 1605-02Re. 1907-10Re, a lavender self with a darker fall overlay, is a sibling to 'Cool Character.' Their parents are 'Blatant' x 'All Revved up.' I've posted this one several times. It is a prolific rebloomer, but I've not been able to get any takes as either pod or pollen parent. 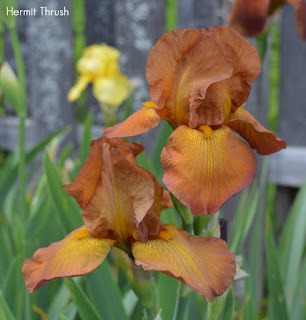 As iris breeders often state, "there is always next year!" This summer I've had rebloom stalks on a couple of west coast irises. 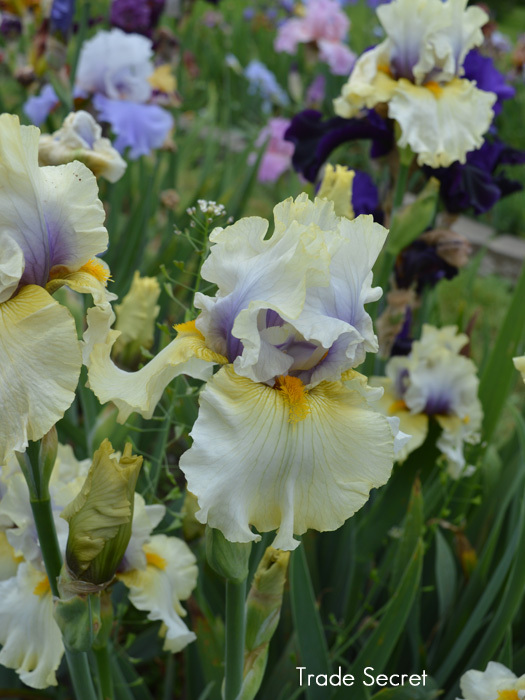 'Carousel of Dreams' was among a group of irises reported to be reblooming in Joe Ghio's garden in early summer. I ordered five or six and this iris was one of the group. 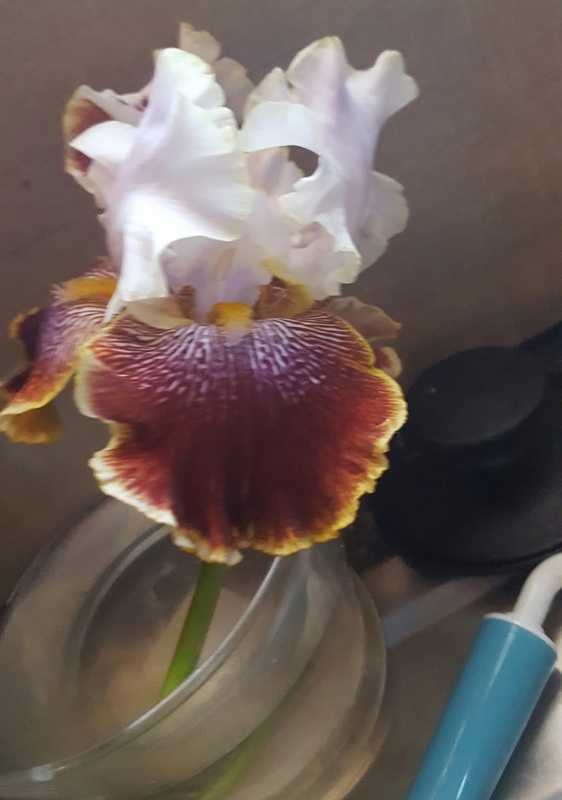 It started putting up a stalk almost immediately. The other iris from the west coast is 09-75C, a seedling belonging to Keith Keppel. 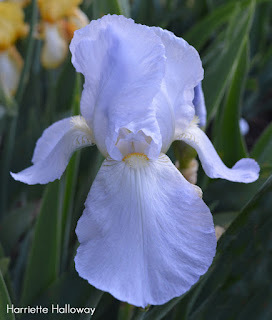 It's from 'Adriatic Waves' x 'Noble Gesture,' one of my favorite introductions of Keith's. Both of these had already set stalks on the west coast, and with a little water and fertilizer the stalks popped right up! These would need an especially long cool summer to set and produce rebloom stalks and this is rare. 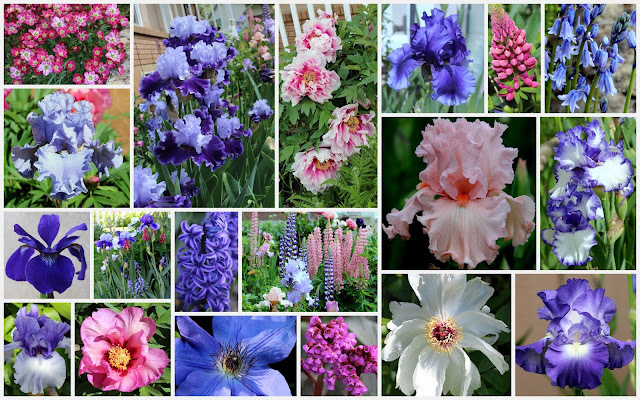 The year 2006, with it's six week long spring and mild summer, is the only time I recall a large number of sporatic rebloomers in my garden. Then along came a couple of brand new seedlings. This first one may or may not be 2611-04Re. 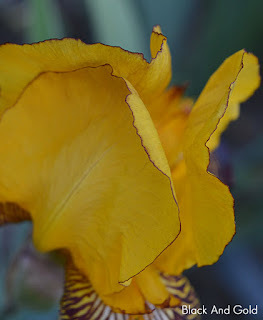 It grew and bloomed right at the edge of the clump and may have been from the clump next to it. When I checked it out, it really looks like it's on the edge of 2611-04Re. Somehow, I'm not really buying it, but I will line both out and see what I have once they both bloom again. 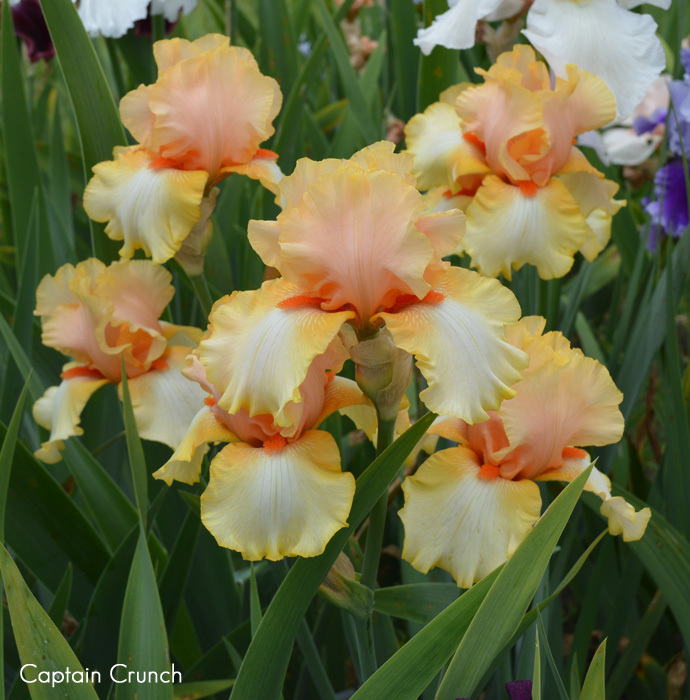 'Star Gate's' beard looks even prettier on this one! Love this one! This is 2612-03Re ('Again and Again' x 'Echo Location') X 'Over and Over.' I must admit it is starting to grow on me. 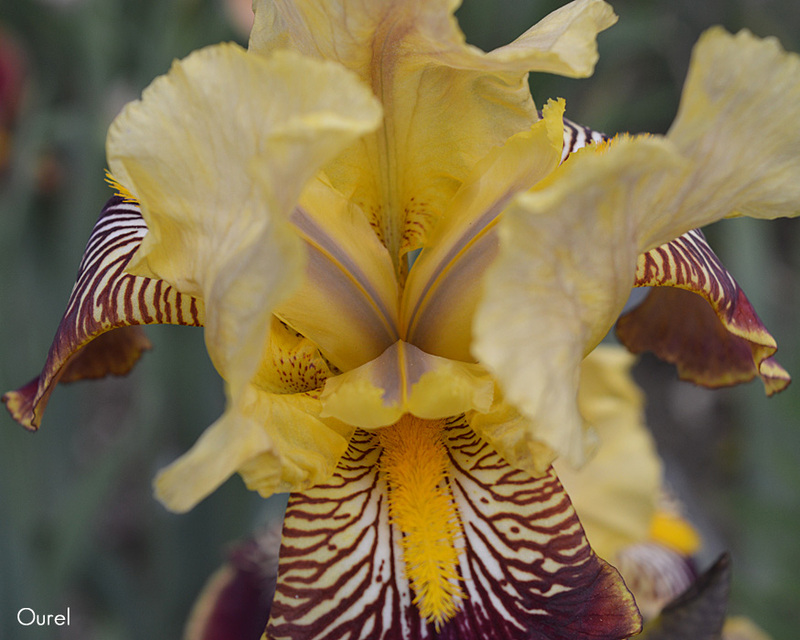 The first bloom was rather weather beaten and the standards were open, but this bloom shot was taken later and I really like it. 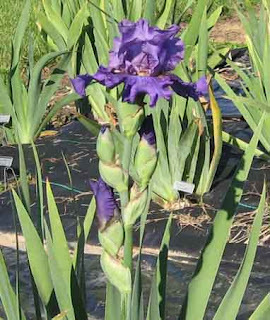 There is a second stalk that is starting to show color now. The always present, ' Over and Over' managed to put up stalks on all three of the new clumps. 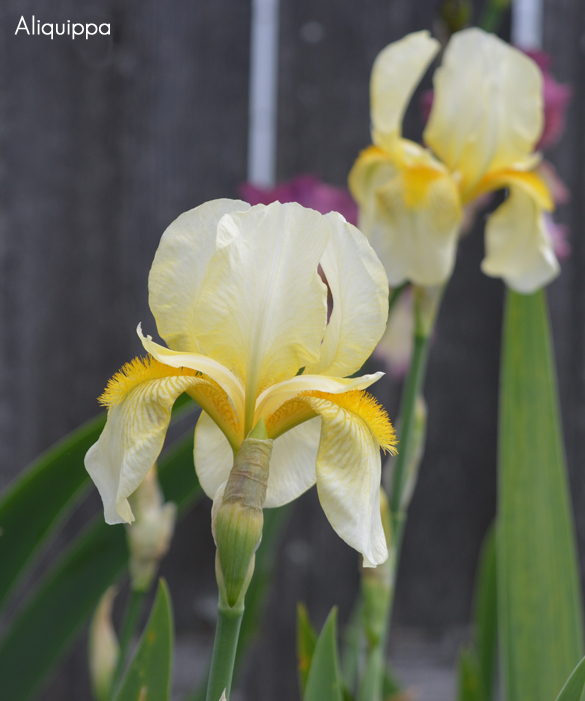 Two clumps put up two stalks each. 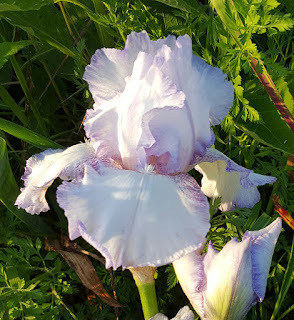 One was planted, bare roots, last fall and it bloomed earlier in the summer, but the other two clumps, planted this spring, still with bare roots, are blooming October 1. Its been a good iris year here with lots of rebloom, and I hope you've had a nice reblooming summer and fall. Let us know what rebloomed for you in 2016. 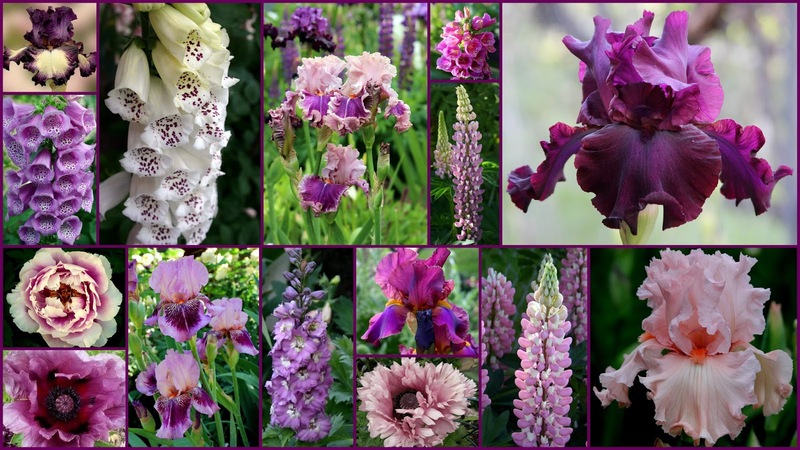 Make a few rebloom crosses next spring and see what you get. 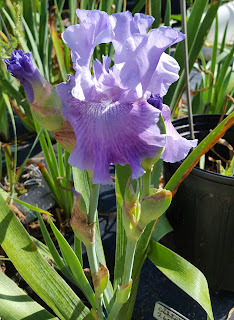 If you cross two things that summer bloom for you, there is a good chance you will get some seedlings that summer rebloom, also. 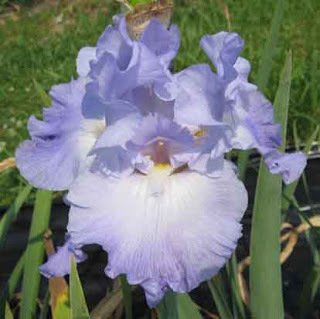 Two fall or cycle rebloomers will usually give fall or cycle rebloomers. Enjoy! Having put off seed cleaning much too long, today I cleaned seeds of all the iris pod bags collected this year, with a dry windy day to help the cleaning process along. 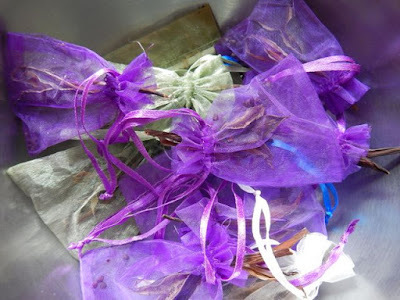 Organza party bags with PCI 'Mission Santa Cruz' seeds inside. 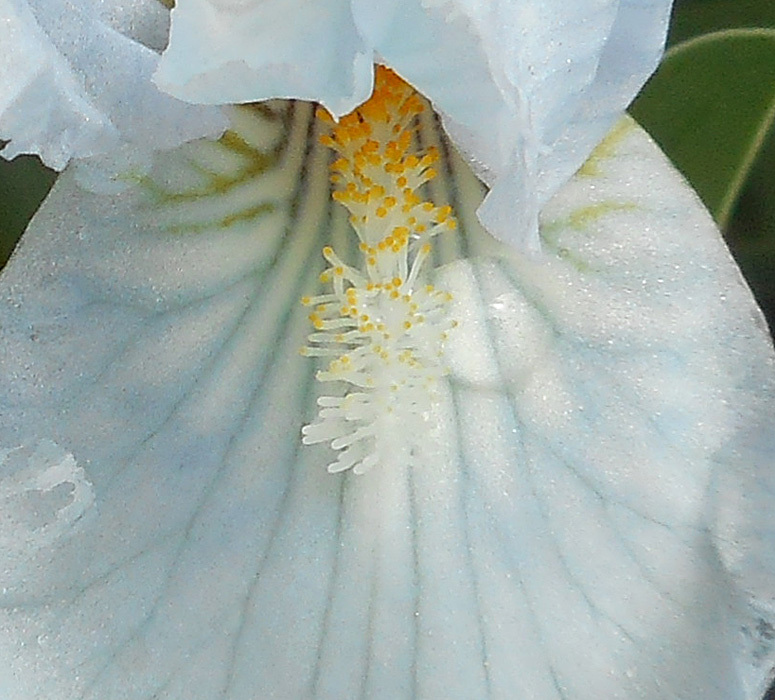 The goal: To contain the seeds that this open pod sheds. Mission accomplished. Organza party bags do a nice job of containing seeds as the pods ripen on the plants outside. Moss green fades nicely into the background, ensuring that those pods can hide for a year or two. Brighter colors ensure you can find the bags sooner rather than later. I put the pods in the bags into a clean, clearly-labeled brown paper bag to dry out of the sun in a cool spot in my house. 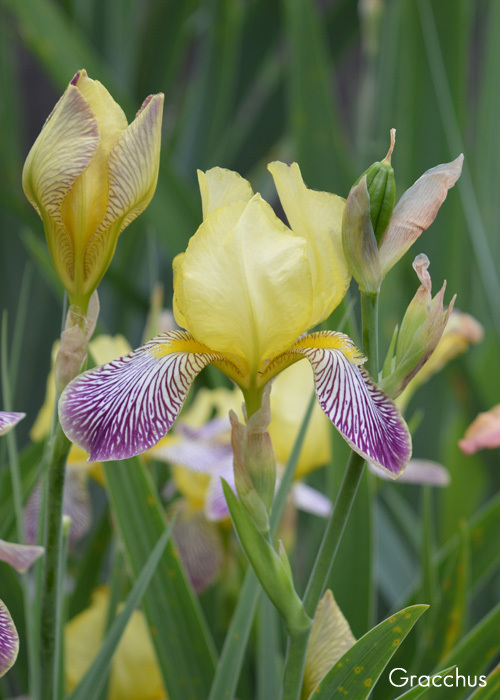 The first seeds would ripen in June, but that lot is largely Ghio hybrids, which flower in March-April, and almost never set seed. One year there were more than 10 pods on PCI ‘Finger Pointing’. I bagged them, sent all the seeds to the seed exchange. That plant hasn’t set seed since. The irises that flower in May and June are the ones that reliably set seed in my garden. I bag pods ahead of ripening from late July to late August or early September. This is much later than gardens on the south half of the West Coast. Tools: Mesh strainer, metal bowls, and fingers. 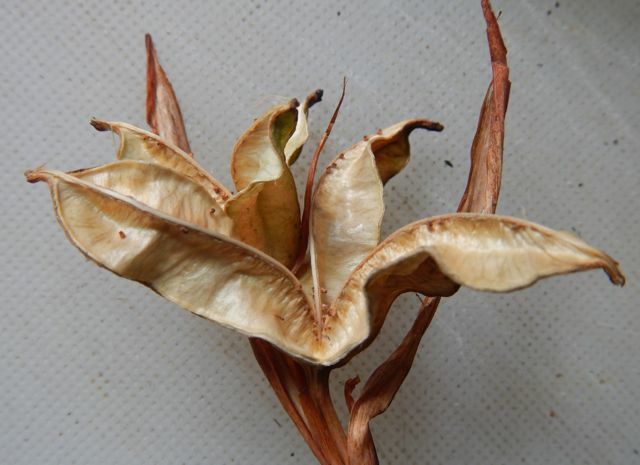 I open the pods indoors, and shell out the seeds. Then I take the bowl of seeds with debris, and a second bowl outside, find a steady wind, and pour the seeds slowly from one bowl to another, about a foot apart, letting the wind separate out the chaff, dust, and other non-seed bits in the air between the bowls. 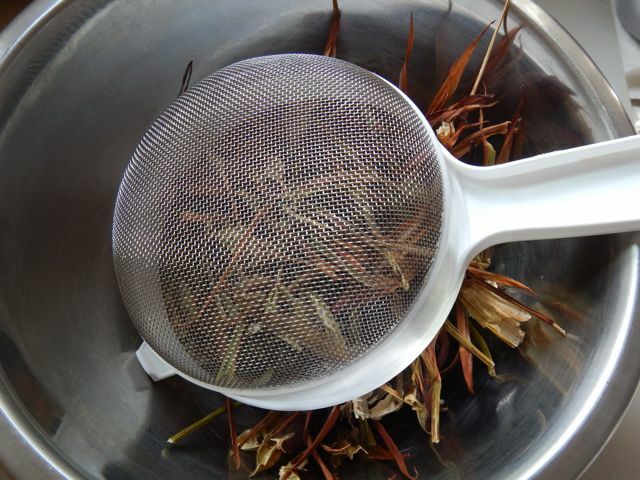 A wire mesh strainer and lightweight metal bowl help when opening pods and cleaning off fine debris. 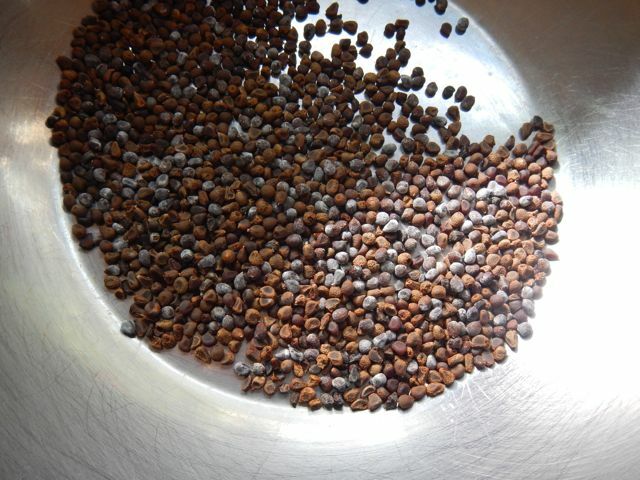 One lot of seeds was rapidly splitting pods when I went out to cut them off the plants. I scraped up some seeds to add to the bag, so that bag had sand and mulch in it too. No photograph of this needed! It took about 8 pours, stopping to clean the empty bowl each time, to get the lighter debris out of that lot. I then had to pick out the mulch bits by hand. Note to self: next year, cut off the pods you aren’t collecting, and if they hit the mulch, scrape it up and put it somewhere where the seeds can germinate on their own. The first autumnal storm blew through yesterday. Today with much lighter winds, I could trickle seeds from one bowl to another and let the wind blow off the lighter debris. I do this over a garden bed, so if seeds do blow out in a hard gust, they land where they can germinate. Easy pods to clean! 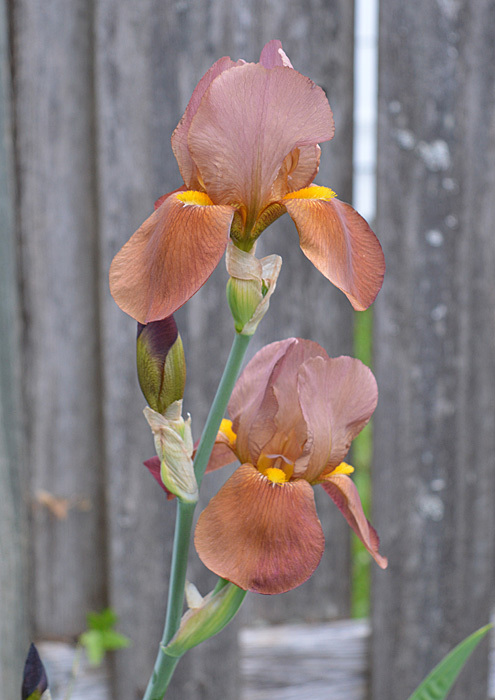 These Iris tenax pods open on their own. 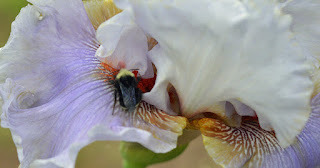 All I have to do is check for seeds caught in the crevices. Pods vary widely in their ability to open on their own. Species pods do very well, especially Iris tenax, I. innominata and I. chrysophylla. 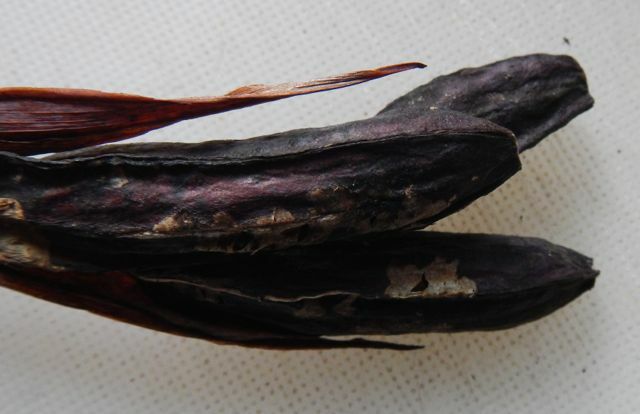 For these seed lots, cleaning is a matter of checking the sections in each pod to make sure no seeds are still lodged inside. 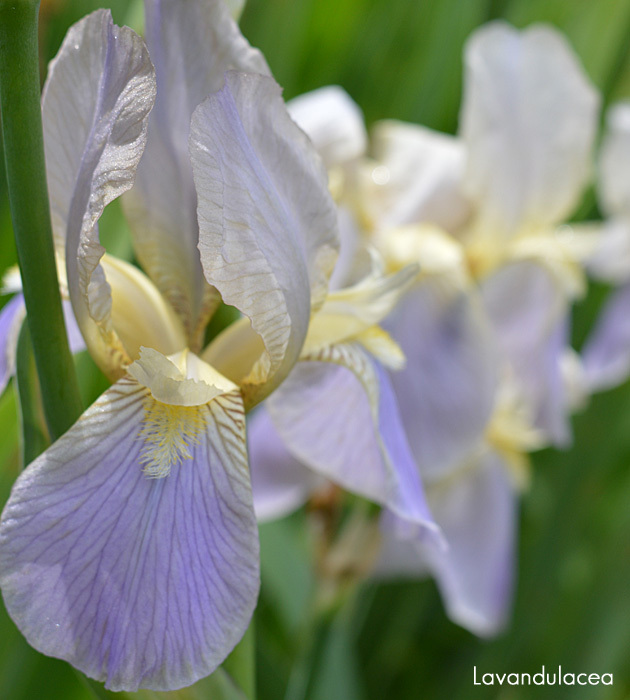 Annoying pods to clean: Iris douglasiana pods often stay tightly closed in my climate. I clip the tips off, see lower photo, then pry out the seeds if removing the tips hasn't loosed the sutures along each section. Not so with Pacifica hybrids, as these pods, like Iris douglasiana, tend to be slower to open, or many not open at all. I cut off tips, break pods in half, roll them in my fingers or between palms to loosen seeds, then shake and pry them out. It’s a slow process. 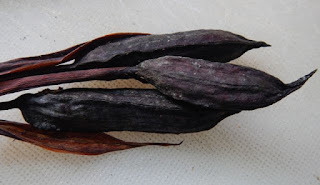 If I have the time, when the seeds are ripe but the pods are not yet fully dry (as they’ve turned yellowish brown), I open the pods as I cut them. They pull open like a three sided pea pod at that stage. Later, the pods are hard and the sutures, the splitting lines between the sections, harden. 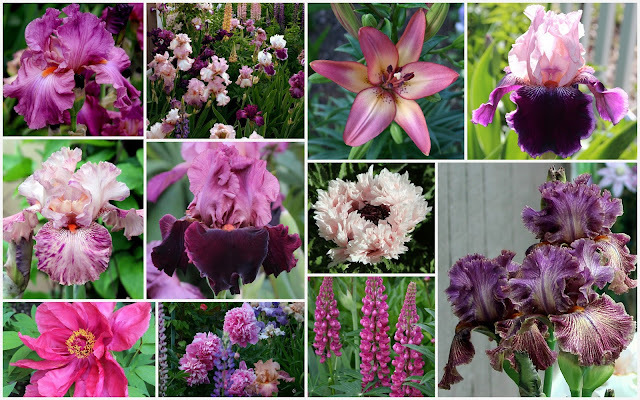 It might be climate: gardening on the Pacific Northwest Coast, we do not experience the heat of gardens to the south along the West Coast. 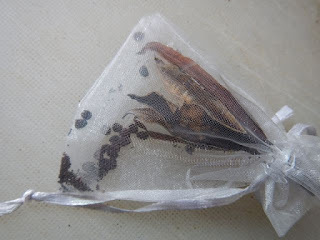 Cean dry seeds to send to the seed exchange. The result: Clean seeds, with bugs, larvae, spiders, earwigs, snails and other seed and pod grazers removed, ready to bag and send to the seed chairman for the SPCNI Seed Exchange.